Inhaled medications are very effective against mild to moderate asthma attacks. In severe acute asthma hospitalization, nebulization and intravenous drugs may be needed. 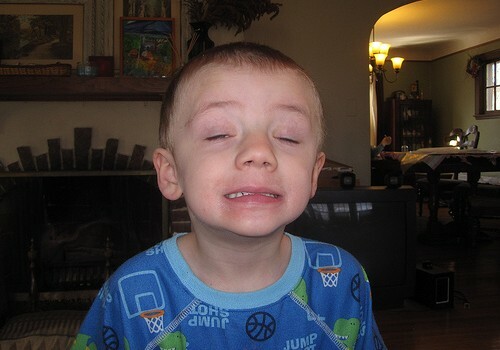 Treatment should be offered in accordance with your pediatrician’s prescription. Delivery methods include metered dose inhalers, dry powder inhalers and oral drugs. Spacer devices may be used to maximize drug delivery into the respiratory tract. Salbutamol, Salmeterol (beta 2 agonists), terbutalin and ipratropium bromide may be given as first line treatment. If the response is good the dose may be repeated 2-3 hourly till the acute stage is passed. If there is no improvement, the dose should be repeated after 20 minutes. If there is still no improvement, the asthma attack should be treated as an acute severe asthma attack. 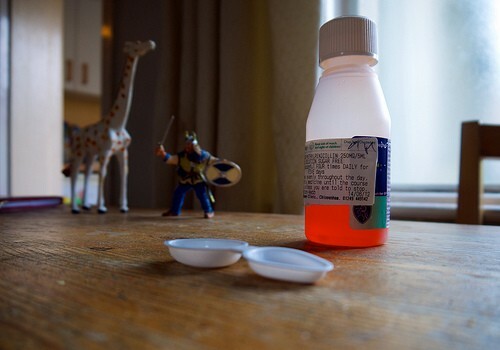 Preventive drugs such as inhaled steroids are of limited use in managing an acute asthma attack. Rapid urbanization, air pollution and a whole host of socio-economic factors contribute to the increasing incidence of respiratory disorders in children. 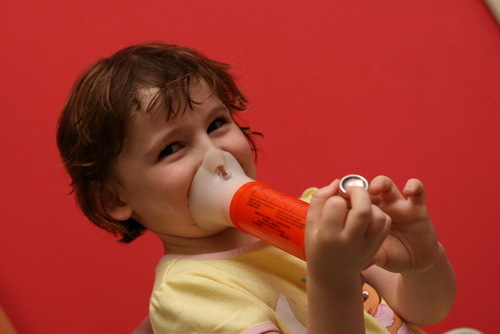 Asthma may be defined as a recurrent cough or wheeze relieved by a bronchodilator. 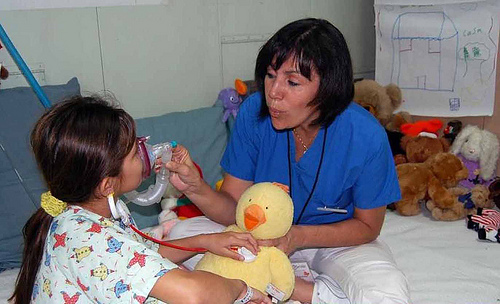 Diagnosis is clinical, especially in small children because they cannot perform the diagnostic tests. Asthmatic kids should grow and develop normally, participate in sporting activities and attend school regularly. This is easily achieved with proper medication. For parents with an asthmatic child a clear understanding of the background, symptoms, causative factors, triggers, danger signs and treatment is essential. Quick recognition and treatment may be the difference between life and death in a life threatening asthma attack. An acute severe asthma attack is always a possibility in an asthmatic child exposed to allergens, viral diseases, weather changes and emotional upheaval. Anxiety, restlessness, sweating, difficulty in breathing, rapid breathing, extra effort in breathing and rapid heart rate are known features of asthma. These may be associated with chest pain, disturbed consciousness, difficulty in speaking and feeding, rising pulse rate, low oxygen saturation and a silent chest on auscultation. These children need immediate hospitalization, rehydration (a lot of water is lost through rapid breathing), oxygen therapy (to improve oxygen delivery to the blood) and steroid therapy. The “five step rule” is a set of instructions that is easy to remember and follow in the case of an asthma attack. Step one: Take two puffs of the reliever inhaler (usually blue colored) immediately. Step two: Sit upright and stay calm. Step three: Take slow deep breaths. Step four: If there is no improvement take one puff of the reliever inhaler every minute. Step five: Call the emergency number if you are worried or there is no improvement after following the steps. Lying down and putting a comforting arm around the patient actually makes breathing more difficult. 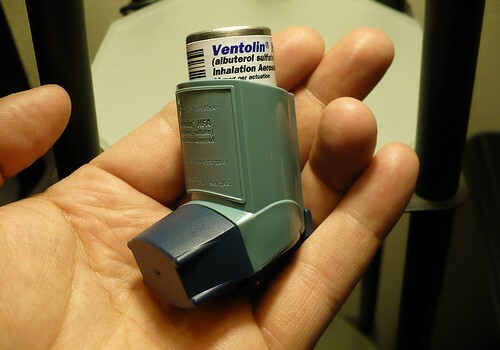 Taking multiple puffs during an acute asthma attack is safe, so do not worry about over-treating. Asthma prevention starts during pregnancy. 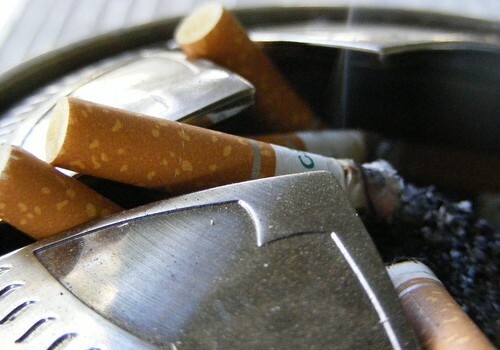 Smoking during pregnancy is associated with childhood asthma in offspring. Exclusive breastfeeding during the first six months of life is strongly recommended, to provide good immunity to the baby and prevent atopic disorders like asthma, rhinitis and allergies. Risky foods such as cow’s milk, eggs and peanuts should be avoided in early childhood. Households with infanrts should be free of dust. Regular hovering helps. Smoking should be prohibited in a house with an asthmatic child. Soft toys and furry animals should not be allowed to come into contact with an asthmatic child. Proper warm clothing is essential because cold may trigger an episode. Viral infections of the respiratory tract may also trigger asthma attacks. Prompt treatment for such conditions help prevent infective exacerbations of asthma. Infrequent asthma: Symptoms are mild and only one or two episodes occur during the course of a year. Sleep is not disturbed. Hospitalization is not necessary. Symptoms are easily controlled with a beta 2 agonist (Salbutamol). The peak expiratory flow rate is more than 80% of predicted value. Mild persistent asthma: More than six episodes of coughing and wheezing occur per year. Sleep is disturbed occasionally and hospitalization may be necessary. Peak expiratory flow rate is more between 60 and 80%. Severe asthma: A small percentage of asthmatic children has severe cough and wheezing more than once a week. Sleep is disturbed. There may be several hospitalizations. The peak expiratory flow rate is less than 60% of the predicted maximum. 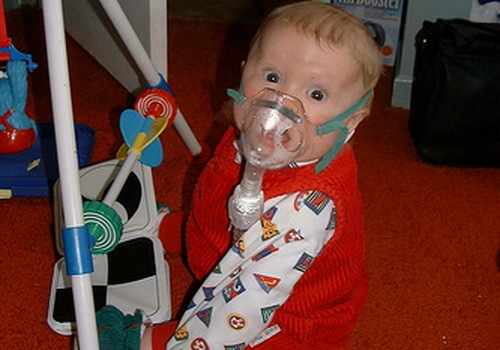 A severe asthma attack is an alarming experience for both the child and the parent. A cool head will help assess the situation and ensure quick action is taken. If the parent is anxious, the kid will automatically be nervous. Calming down will minimize medication errors. Calming the child down will help relieve some of the symptoms. Calming down will relieve anxiety, slow down the heart rate, bring down blood pressure and make the assessment easier. Parents can practice relaxations exercises with their asthmatic children before an asthma attack occurs. At the emergency unit, oxygen will be given via a face mask or nasal prongs. A low oxygen flow rate to maintain oxygen saturation above 95% will be adequate. A pulse oximeter (a clip applied onto a finger) will be used to monitor oxygen saturation. Intravenous cannula will be inserted and an intravenous drip will be started to maintain hydration. Children get dehydrated faster than adults because of their unique distribution of body water. Hydrocortisone will be given intravenously in repeated doses until improvement occurs. Nebulization of bronchodilators will accompany the steroid treatment. If these measures fail, aminophylline is the next step. Intubation and ventilation will be necessary if all these fail. Most children improve well before this stage. It is very important to recognize the breathing pattern. Never underestimate the severity of an asthma attack. Breathing noises will be less intrusive in severe asthma compared to a moderate attack! An acute asthma attack is characterized by breathing difficulties, rapid breathing, anxiety, agitation, restlessness, a rapid heart rate and intense audible wheezing. 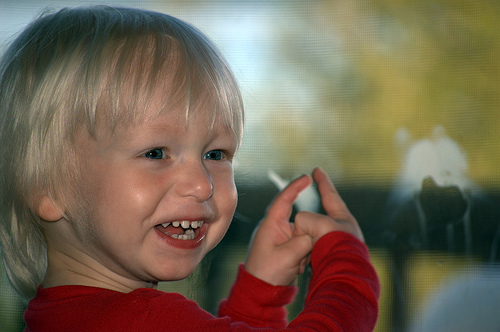 The child’s fingers may become bluish (cyanosis). Whispering speech suggests a significant obstruction of the airways. Small children and infants are unable to take feeds during a severe asthma attack because they cannot stop breathing long enough to swallow. The chest will be expanded and extra effort is needed to breath. Metered dose inhaler with spacer: Assemble spacer, shake the inhaler well, remove the inhaler cap and insert it into the port on one end of the spacer upright, keep the mouthpiece of the spacer between your teeth and make sure your lips are tightly sealed around the mouthpiece. Press the inhaler once to release one puff, breathe slowly and deeply 4 to 5 times. If prescribed, press the inhaler again to release the next puff. Metered dose inhaler without spacer: Shake the inhaler well and slowly breathe all the way out. Remove the inhaler cap and put the mouthpiece between your teeth. Make sure your lips are sealed around the mouthpiece, press the inhaler once to release one puff while breathing in deeply, hold the breath in as long as comfortable, and then take the next puff if prescribed. Is there difference between asthma and bronchitis? Are Parents Aware of Their Child's Asthma Symptoms? What's New In Asthma Treatment?